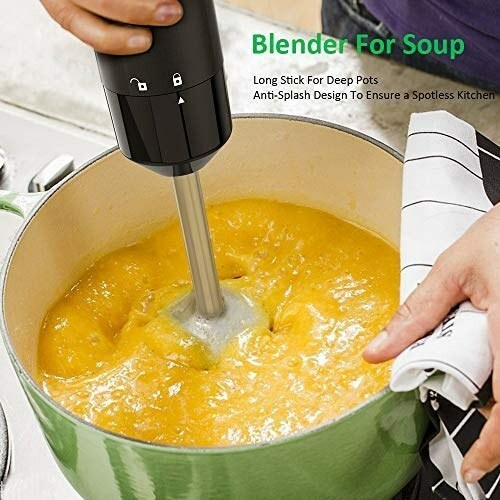 Homgeek 4-in-1 Hand Blender is perfectly suited for preparing dips, sauces, soups, mayonnaise. 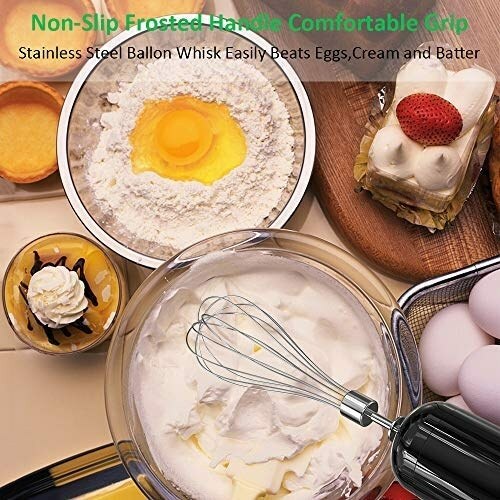 · 4 IN 1 & ALL-IN-ONE COOKING - Comes with Homgeek hand blender main body, 800ml food chopper bowl, stainless steel mixing stick, stainless steel egg whisk, 1000ml beaker with lid, user manual, mixing stirring puree and emulsify and more function. Protein shakes, salsas, broccoli soup and mayonnaise of mouth - watering flavors Multiple needs. 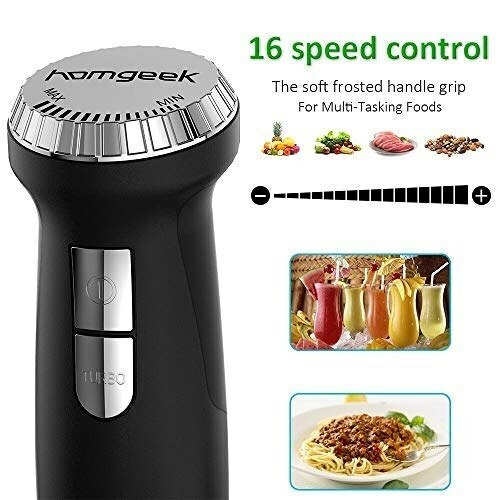 · 16 SPEED & TURBO SETTING - Homgeek versatile immersion blender offers you extremely convenient speed control of 16 dial and with one turbo button and one normal button. Feel free to switch.Simple speed control for single head use. Save time for your convenience. · EUROPEAN QUALITY & STURDY DESIGN - The full copper motor withstands continuous use and will last 3X longer than competitors' motors. Lightweight and durable. 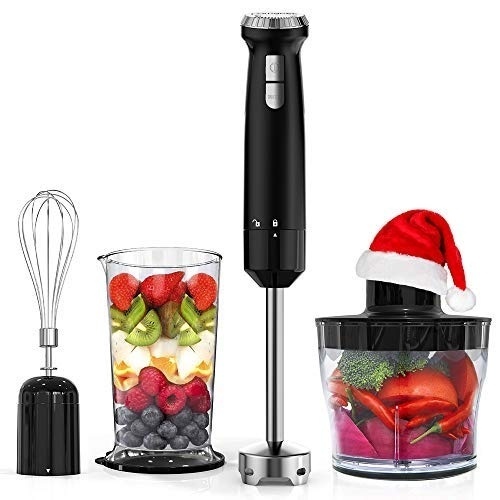 The soft frosted handle grip offers a non-slip and comfortable grip when continuously blending ingredients. Compact ergonomic design, without excessive vibrations or noise. 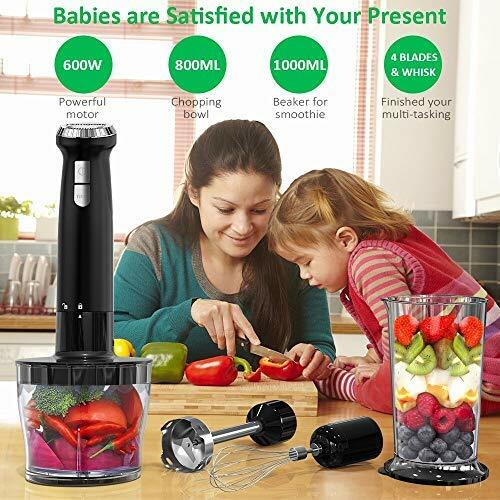 Gives you plenty of comfort and control, when using the blender. · BREEZE TO CLEAN - Rinse the blade under running water and it will be shinning like new again. Detachable accessories dishwasher safe. Please do not stir especially hard ice cubes.Gradually keep adding a small amount of water before storring the food which would prevent any motor damage. 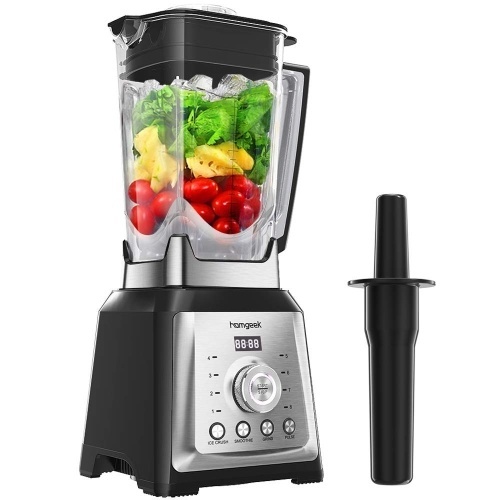 To maintain your blender motor,please wipe away the water and keep it dry and clean. We're dedicated to enhance your cooking experience.If you receive a product of which package is beat up or blade has broken off,not from abuse,please contact us and we will replace it or 100% refund you!